“The day Aliza was born, our happiness knew no bounds. She made our family complete. I still remember the day we brought her home and our elder son was jumping around us to get a glimpse of her. We named her Aliza which means "Joy" and she really did bring joy into our lives. 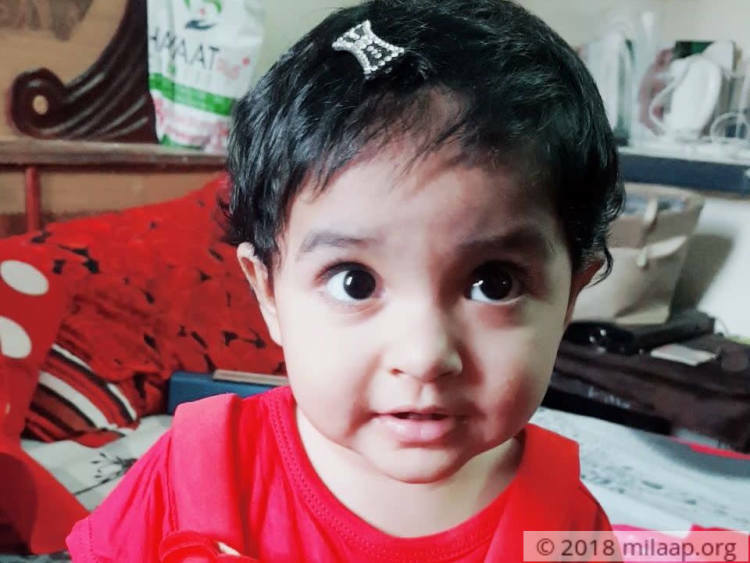 We never thought before she could celebrate her first birthday, she will suffer from a disease that threatens to kill her". Shireen, Aliza’s mother. Little Aliza has been diagnosed with Type I Leucocyte Adhesion Deficiency (LAD)- a life-threatening condition where even a common cold or a small infection could be fatal. The infections could develop any of the soft tissues- such as her gums. This disease causes slow healing of wounds and could even lead to death without treatment. She looked absolutely healthy when she was born. There were no complications at all. But we noticed that Aliza took a lot of time in healing from wounds and recovering from other infections. She was eating all fine but her growth was also not normal. When we got to know about her disease, it was already too late. Doctors say that if we don’t get her a transplant soon we will lose her.”Now every passing minute is a nightmare for us. ” - Shireen. 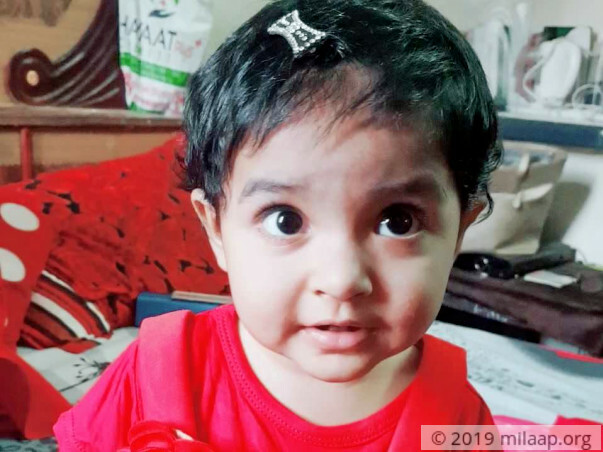 Aliza has been suffering from numerous infections from a few months after her birth. 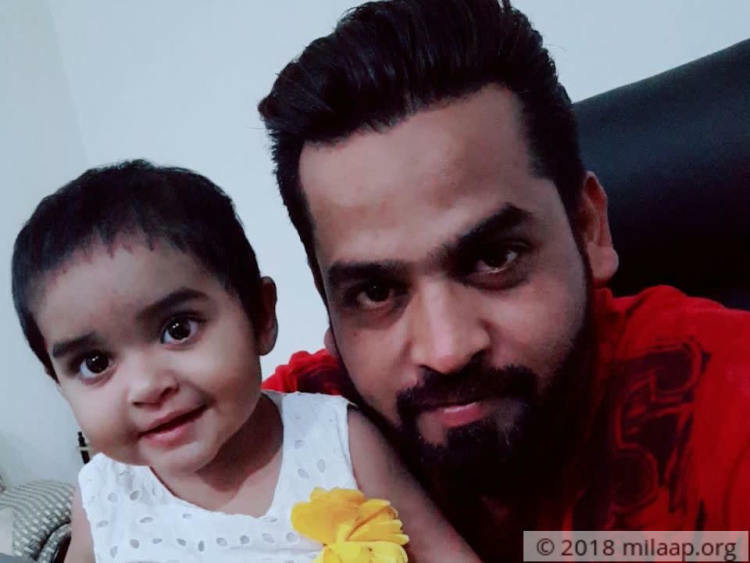 Shireen and his husband, Abdullah had no idea that these seemingly simple infections can become so grave and threaten their daughter. Alisha has to be rushed to the hospital whenever her condition worsens. She screams in pain as blood starts coming out of her wounds. Shireen holds her tight and tries to calm her. Abdullah is a technician with no fixed job that would fetch him a regular income. He gets paid whenever there is work. But Abdullah never made his family suffer. His family never slept with an empty stomach. But now, their lives have changed. “Our savings are over and only after we borrowed from our friends and relatives that we were able to arrange for the initial costs of the treatment. 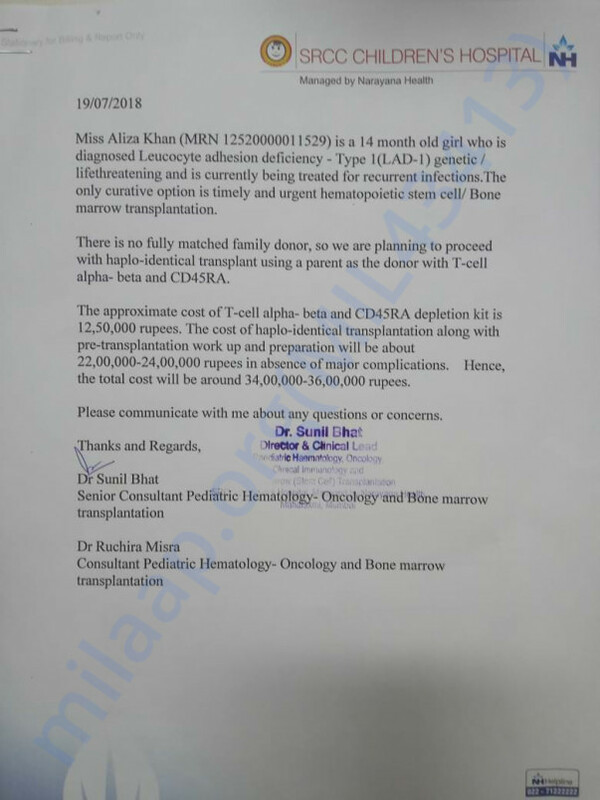 The transplant would cost 36 lakhs. Every night I go to sleep with the thought that if the money is not arranged, I won’t get to see my daughter any longer. ” - Abdullah. 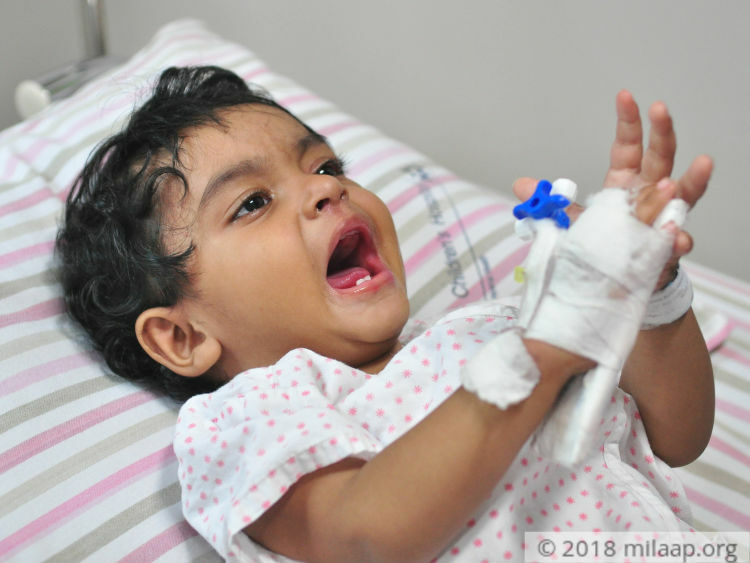 1-year-old Aliza has recurrent and multiple infections that would end up turning fatal for her unless she gets urgent bone marrow transplant in few weeks. The cost is huge and the parents, who are struggling to make their two ends meet, are in no position to save their little daughter. 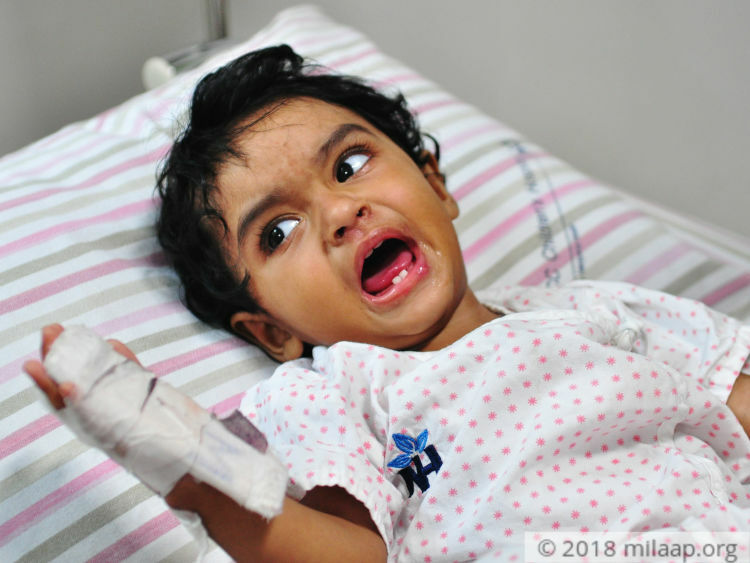 If the surgery doesn’t take place, Aliza will not survive this terrible disease. I am humbled by the love and support given to my daughter Aliza. She has not been doing well and has high fever, cough and cold. The doctors have told that she needs to be operated as soon as possible or her health will keep getting worse. This helpless mother requests all of you to please share the campaign and donate so that I can get my child operated before it's too late. Thank you to all of you. Aliza is doing better now. She is not falling sick as often as she did earlier. The doctors have given her medicines but they say that she needs the bone marrow transplant because the medicines can only do so much. We take her for check ups once of twice a month. It is my humble request to you all to please keep sharing the campaign because the bone marrow transplant is a necessity for Aliza and this will be possible only with your support. Here's an update on Aliza's health. Currently she is at home. Her codition is deteriorating and is regularly following up with the doctor. She is yet to undergo her bone marrow transplant surgery as they are waiting for the funds. We request you all to please share this campaign and keep supporting Aliza.